The Search is on for Hari at Hiyas ng Hinugyaw 2011! 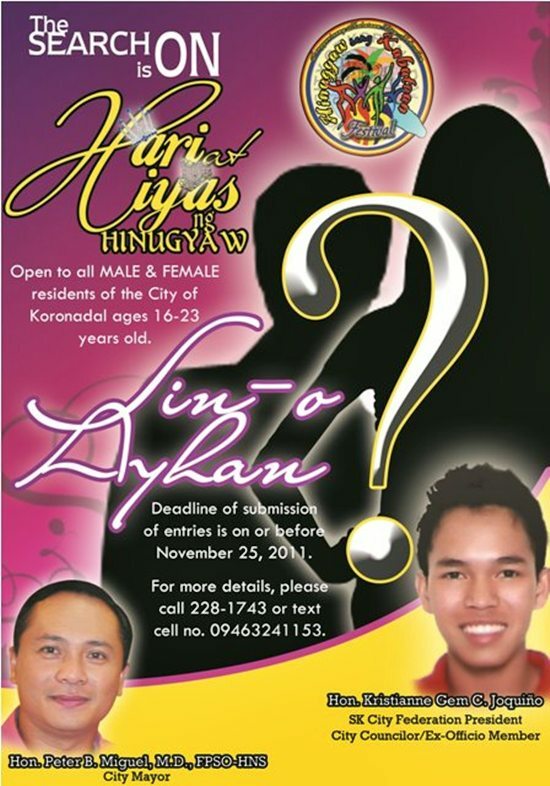 Calling interested individuals ages 16-23 years old, Male or Female from the City of Koronadal, the search is on for the Hari at Hiyas ng Hinugyaw 2011. The Hari at Hiyas ng Hinugyaw search is in-lined with the Hinugyaw sang Kabataan Festival 2011 celebration organized by the Sangguniang Kabataan City Federation in the City of Koronadal from December 15- 17, 2011. Deadline for submission of entries is on November 25, 2011. For more details, contact 228- 1743 or text 0946- 324-1153.